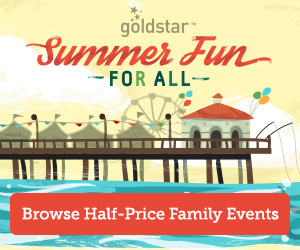 Whether you love purchasing half off tickets through Goldstar or have never used the site before, Goldstar is offering a promo code for a FREE $5 off your purchase for both first-time and frequent users! Simply enter the promo code BOSTON in the gift certificate line to take $5 off any purchase at Goldstar.com! (Now Expired). If you are not familiar with Goldstar, Goldstar has so many half price (and sometimes even free!) tickets to live entertainment, tours, cruises, and so many more fun things to do in Boston and across the country! I tried the promo code with the AMC Yellow eTickets through Goldstar for $9 for two tickets and it worked perfectly! After the Free $5 promo code, the two AMC movie tickets ended up being $7.25 each which makes for a cheap date night! Make sure to add the promo code BOSTON to see the $5 off your ticket purchase! I didn’t see any limitations to this, as it was applied to the service fees to free tickets as well! Keep in mind that this promo code is only valid for a very limited time– so make sure to buy your tickets soon to get the free $5 credit! For more information about Goldstar Boston or to purchase tickets, please head here. Such a cool offer and a great way to save a little extra on some summer fun! *I am an affiliate partner of Goldstar, please see my disclosure policy if you have any questions.